Brian Witherspoon (born June 5, 1985) is an American track and field runner and former American football cornerback and return specialist. He was signed by the Jacksonville Jaguars as an undrafted free agent in 2008. He played college football at Stillman. 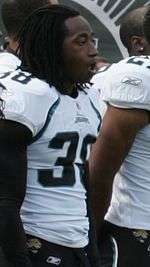 Witherspoon was signed by the Jacksonville Jaguars as an undrafted free agent in 2008. He tore his ACL for a second straight season during offseason practices with the Giants, and was waived/injured on May 24. Witherspoon has also played for the Detroit Lions, Carolina Panthers and New York Giants. In July 2013, Witherspoon retired from football to be a full-time track and field runner. He qualified for the US Track & Field Nationals in both the 100 meters, with a time of 10.22 seconds, and 200 meters, with a time of 20.66 seconds.